“”You have to have the rain before you can have the rainbow” In just 24 hours I would be walking along Santa Monica Pier in SoCal as us surfers know it, the sunshine on my face and the sand between my toes. You can’t beat a bit of winter sunshine to recharge the batteries after Christmas. And as if I needed any more incentive to go I had the promise of a date with the not too shabby Natalia Velez to look forward to. But first I had a date with one of Essex’s finest – Canvey Island who were visiting the Dripping Pan for an early doors game against The Rooks. Early doors because of Brighton’s cup game versus Newcastle United just down the road at 5.15pm. Thanks to the Ryman League seeing sense, and the Essex side happy to leave Lakeside an hour earlier than normal, Lewes stood a chance of a decent crowd. We littered the Toon websites, forums and Twitter feeds with invites and promises of pints of Dog, Jimmy Nail look-a-likes and Lewes wearing a special one-off black and white striped shirt just for the day. Not strictly true but would they really notice after tucking into a few pints of Harveys? Our cause had been helped no end by the efforts of the Guardian’s sports team who plugged the game via their Fiver email, eulogising that :- “At this quaint little ground, you’ll be allowed to stand up, smoke your gills out, watch entertaining Brazil-circa-1970 style football, eat delicious modestly priced organic burgers and lorry back refreshing pints of the local brew Harveys all at the same time” Thanks to some opportunist sales techniques that would have shamed a time-share salesperson in the Canary Islands I had managed to convince The Guardian’s Barry Glendenning as an owner a few weeks ago. Yes, he had been worse for wear; Yes, he was distracted by Sarah Hot Scores and yes I may have told him that by being an owner he was entitled to certain perks that weren’t strictly true, but Pressganging is not illegal (I think) in the 21st century. One man’s Richard Branson is another man’s Asil Nadir. Barry was making his first visit to the Pan and we were determined to make his visit a special one. After all, since he thrust the £30 in my top pocket back in December, “our” team had won three, drawn four and lost four as well as seeing the manager depart. Investments can go up and well as down as I reminded him when he asked for a refund. Canvey Island, the Gulls, the pride of Park Lane. 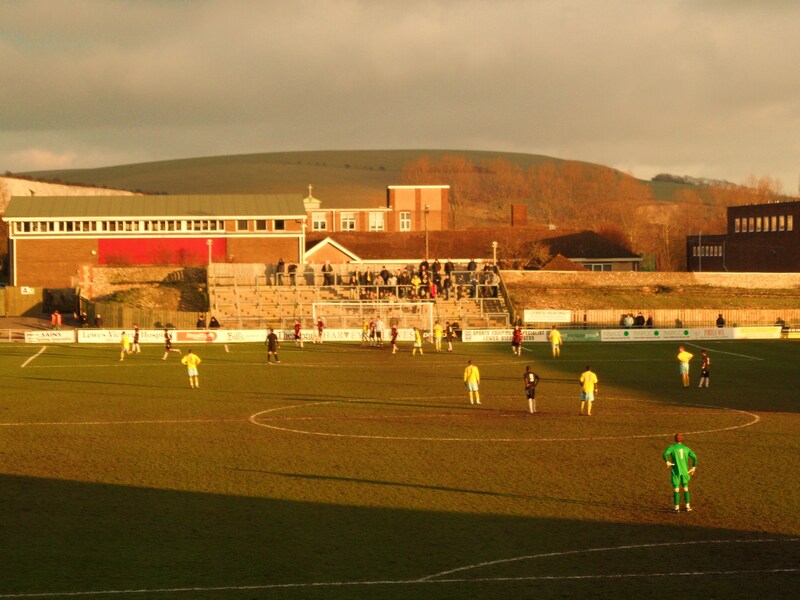 Lewes had already beaten the Islanders earlier in the season and what they could do with a moral boosting win today. Performances had been good, but a lack of goals was becoming a real worry. Five goals in the last six wasn’t a fair return for the effort, but add on the fact that three had come from penalties and you see the issue. Last Saturday the team lost 5-1 at Margate. Lewes shots 8, Margate shots 8. On Wednesday night the woodwork and a bobble in the six yards area stopped two certain goals. Today there was to be no excuse. It was win or bust….well not exactly that traumatic but we are hyping this up for the Guardian remember? This was my third trip to Lewes in just four days after the Sussex Senior Cup match on Wednesday and then the Fans Forum on Thursday where we had batted away all questions fired at us from the fans. Now was the time for us to live up to our promise of Barcelona-esque football. Lewes 1 Canvey Island 2 – The Dripping Pan – Saturday 28th January 2012 “You will win nothing with kids” One of the most famous understatements uttered by a pundit. Alan Hansen may have had to eat his words back when Sir Alex Ferguson blooded the likes of Scholes, Beckham and Giggs at Villa Park in August 1995, but since then how right he has been. Lewes today were forced to field a very young team as injuries ravaged Simon Wormull’s squad. The manager himself was even forced to play himself for the final thirty minutes, turning back the years with some of his visionary passing. I can only imagine the mood in the Wormull house when the sick notes arrived this morning. Kamara – hip injury. Robinson – hamstring. Hamilton – foot. Hustwick – neck strain. These four are the Lewes back four. Any club would struggle to cope with such a situation. A major reshuffle saw Charlie Leech and Jack Phillips in the starting line up as well as new signing Jack Walder in the centre of midfield. One good bit of news was that the Rooks had ditched the white shorts – going down the full Rosseneri look of red and black – Canvey opting for Crystal Palace away circa 1989. It was the yellows who started the stronger of the two and thankfully keeper Rikki Banks was in good form. With Lewes’s recent goals coming from the boot of Paul Booth it didn’t take a brave man (me) to predict he would be the first goalscorer, although Eddie Freemantle refused to take my tenner, reminding me that as a Director I was not able to place a bet on my team. Sure enough, a minute later Paul Booth rose and headed home a Nanetti cross to put the Rooks one nil up. The second half saw Canvey well on top and it was no surprise when Jason Hallett scored in the 51st minute. We weren’t used to conceding a goal before the 90th minute so the crowd were stunned into silence. Everyone was confused. What to do? Well, how about the player/manager bringing himself on…Wormull stripped off and within a minute had played a trademark cross field pass to Nanetti. Every touch was greeted with a cheer. Could he win us the game and roll back the years? Alas no. Canvey got stronger as the game wore on and with twenty minutes to go Bradley Woods-Garness smacked a loose ball home to give the Essexmen the three points. The thirty or so Canvey fans went home happy, having enjoyed their day out in the sunshine whilst the Rooks fans had to scratch their heads wondering what the team had to do to get that break and three points. With the rain out of the way it was time to prepare for the Rainbow. Natalia Velez was sure to ask about the result. Don’t worry – I will take this one for the team. Until I return I bid you a fond farewell.